London - Sunderland manager Gus Poyet has been charged with improper conduct following a touchline altercation with his Hull City counterpart Steve Bruce, the Football Association announced on Thursday. 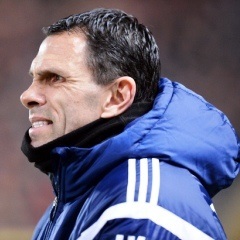 Poyet was sent to the stands during Tuesday's Premier League game at the KC Stadium for kicking a drinks bucket after Jack Rodwell was booked for diving and reacted by walking over to remonstrate with Bruce. Bruce, a former Sunderland manager, responded angrily and had to be restrained by one of the assistant referees, but he has avoided a charge, with the FA instead reminding him of his responsibilities. "Sunderland manager Gus Poyet has been charged by the FA following the game against Hull City on 3 March 2015," the FA said in a statement. "It is alleged that his behaviour in the 35th minute of the fixture amounted to improper conduct. He has until 6pm on 9 March 2015 to respond to the charge. "Meanwhile, Hull manager Steve Bruce has been contacted by The FA in relation to the same incident and formally reminded of his responsibilities." Sunderland were trailing 1-0 when their midfielder Rodwell went down in the Hull box, only to be booked for simulation by referee Mike Dean. After clashing with Bruce, Poyet watched the rest of the match from the stands and saw Rodwell claim a late equaliser to earn the visitors a 1-1 draw.